Tharpu Chuli and Singu Chuli nearby. This is considered a sacred mountain by the Gurung ethnic community. 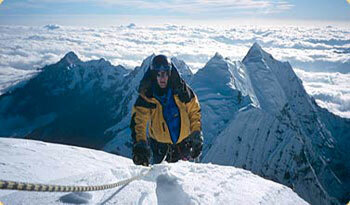 The peak is one of the most difficult peaks to climb in Nepal. It can be climbed from southeast face and northwest face which is not so difficult technically but there is still danger of rock falling. An American Peace Crops Expedition team first ascended the peak in October 1971 via the southeast face. Day 03 : Fly to Pokhara, overnight at Hotel. Day 04 : Drive to Phedi / trek to Tolka, overnight at Lodge. Day 05 : Trek to Jhinu, overnight at lodge. Day 06 : Trek to Dovan, overnight at lodge. Day 07 : Trek to Machhapuchhre base camp, overnight at lodge. Day 08 : Trek to Annapurna base camp, overnight at lodge. Day 10 : Hiunchuli High camp, overnight at tented camp. Day 11 : Summit Hiunchuli and back to Annapurna base camp, overnight at lodge. Day 12 : Trek to Bamboo, overnight at lodge. Day 13 : Trek to Chhomrong,overnight at lodge. Day 14 : Trek to Ghandruk, overnight at lodge. Day 15 : Trek to Naya Pool and drive back to Pokhara, Overnight at Hotel. Day 16 : Fly back to Kathmandu, overnight at hotel. Day 17 : Rest at Kathmandu, overnight at hotel. Day 18 : Transfer to airport, departure to your own destination.